This is a short mini break in Granda, Andalusia, Spain. Enjoy riding on the best roads in the world in and around the Sierra Nevada, the Alpujarras mountains, coastline, lakes, and castles for three nights' stay and two-day guided tour on one of Motorcycle Touring Spain's BMW motorcycles. If you need a companion on your motorcycle, don't worry because you can bring a pillion for free! 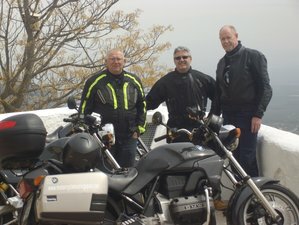 Motorcycle Touring Spain has comfortable rooms, kitchens, internet, jacuzzi, bar, barbecue, terraces, Wi-Fi, heating, and secure parking for motos. You will be picked up at the airport in Malaga or Granada. Go to the base to pick up your motorcycle and complete the paperwork. If necessary, choose your helmet and clothing. Afterward, relax at your accommodation. You go touring and stop for coffee, photo opportunities, and lunch. In the afternoon, stop for coffee. Your ride is approximately from 09:00 to 18:00 for 180 to 240 kilometers. It's another day tour with a different route. Tour in Granada region, lakes, castles, and mountains. Return to the headquarter. Motorcycle Touring Spain can vary the routes to suit the weather, mountain roads, and coastline. All riders must be in possession of a valid (category A) motorcycle license for at least two years. You are also advised to apply for an International Driving Permit (IDP). These are steep mountain roads. You must be a confident rider. The motorcycle tour covers several areas in Spain, including Granada, Sierra Nevada, and Las Alpujarras. Breakfasts are provided. You stop at lunchtime for typical Andalus food. In the evening, there are various bars and restaurants in the village.